Michael Veitch's life-long obsession with the aircraft of the Second World War led him to conclude that every single person who flew, or flew in them has at least one extraordinary story to tell. With most of these veterans in their eighties, he knew that it was a matter of urgency to find them now, before their personal stories disappear for ever. So, over the course of a year, Veitch interviewed over fifty former aircrew across Australia, many of whom had never spoken about their experiences before, even to their families. The result is Flak – a collection of vivid, unforgettable stories from RAAF veterans about their experiences of combat in World War II. It is also an account of the strange, sometimes obsessive journey of the author himself, as he explores a passion held since childhood. 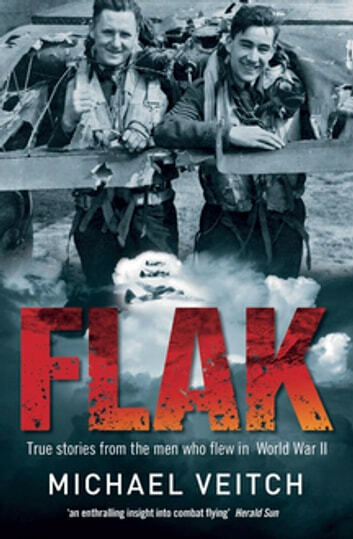 From bomber pilots to fighter aces, from rear gunners to bomb aimers, from stories of death and fear to tales of humour and comradeship, Michael has helped unearth the extraordinary stories of ordinary men living and fighting in extraordinary times.